The ambiguous title of this stunning new release appears to allow us, the audience, to decide what is going to happen next. Yet this is an illusion as the traitorous couple’s future has already been mapped out by the artist with perfect clarity. Contemplation is the first in a series of three betrayal images, the next of which is entitled First Kiss, and the third, No Turning Back. 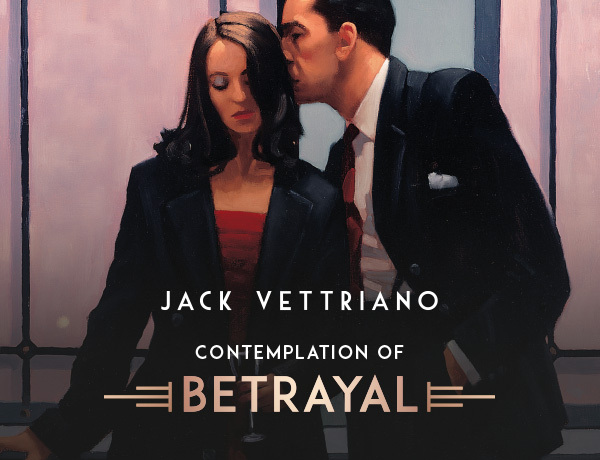 First shown in New York, it then featured in a major retrospective to mark 20 Years of Vettriano’s career which ran for six months at Kelvingrove Art Gallery and Museum, Glasgow. We are delighted to make this piece available and anticipate that it will hit the secondary market at a high price, so we recommend that collectors take the opportunity to buy now at the initial release price.